Erebus macrops/owlet moth/Walker's owl moth had been hovering over our porch and terrace garden for a few days now. We had a similar moth visit us a few years ago. We were able to click a photo, this evening, after a bit of circus. 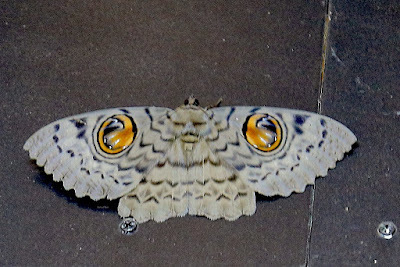 It's the second time that this variety of moth is visiting us. Wingspan is about 6-7 inches! Such a beautiful creature. I've never seen this one.